So, I live in a Canadian suburb which means that there are certain things I can be sure of year over year: whether it's snowing or hot out, there is a chance that the power will go out. It could be that too many people in my 'hood are using their air conditioners or it could be that some ice-laden branch falls off a tree and takes a line down with it. Or there could be an ice storm that shuts down the entire city (and in my case strands me in the country for a week). Or, as when we first moved here, the utility was running rolling blackouts due to power usage on really hot days and didn't we just live in the zone. Which was awesome. Especially when the Dude was a baby and I needed to make him formula. Awesome. Now let's say one of these blackouts hits and I really need to tweet a pic of the candles lit in my living room want to check in on loved ones to see if they still have power, maybe text a neighbour to bring over some extra matches, with the wifi down, I'm going to need a charged cel phone. Which of course is likely dying at the very moment I need it. 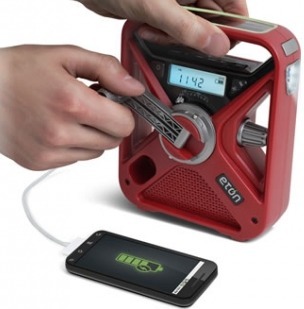 Hand-cranked smartphone chargers! The second one even boasts a radio and a flashlight, and works off solar or turbine power too. One minute of cranking can charge your phone enough for some quick texts, and a full charge on the device can power up your phone to 50%. Oh, and they're actually affordable ranging from $40-$100 depending on the battery capacity. Eton, the maker of these fine devices, calls them: "back up for your back up solution". Now, we keep battery-powered flashlights all over the house, but we have a handcrank one in the hall closet that doubles as a radio, just in case. Super handy. 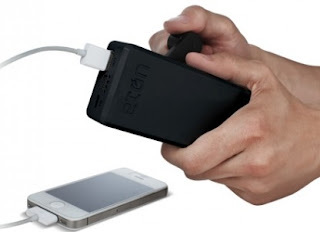 However, it doesn't charge my phone and in emergency situations, I definitely wish it did.